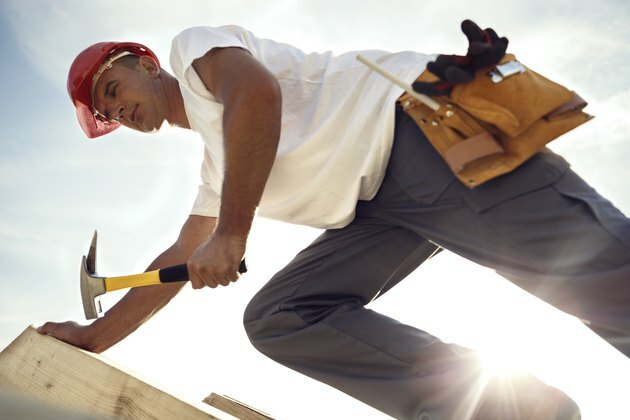 Whether you are replacing your entire roof or repairing a small area, fixing rotten sections of roof decking, or sheathing, is vital to creating a sound, watertight structure. Roof decking, which is nailed to the roof's trusses, holds roofing materials, including felt paper and shingles and also serves to stiffen your home's structure and protect it from wind. Replacing the rotten roof boards helps protect the integrity of your home and prevents damage from leaks. If you're only replacing the portion of the roof with damage, you need to find out the extent and location of that damage. Inspect the inside of your home for leaks. On a rainy day, look for stained drywall or wood on ceilings and in attics or crawl spaces. Remove drywall and insulation as necessary to locate water stains on the under side of roof decking. During a reroof, inspect the decking after the shingles and underlayment have been removed. Tap water-stained sections with a hammer to test their stability. Pry up shingles around the damaged area. Each shingle is typically secured by eight nails: four through the middle just above the tabs and four through the shingle above it. Pull up the felt paper underneath the shingles. Working your way up the roof, expose all of the rotted wood. Leave the next course of shingles intact by carefully removing the second set of four nails. During a reroof, start at the peak of the roof and remove all shingles, prying them up with a pitchfork, working your way down the roof. When replacing roof decking, you first need to get rid of the old, rotten section. You may need to cut a little extra to expose enough of the trusses and make sure you get rid of all the rotten wood. Set the depth of your circular saw to the thickness of the roof decking. Cut away the damaged area. Pry out nails with a claw hammer or pry bar and remove the cut piece. Expose at least two trusses so that you can nail the replacement wood to them to make the replacement section stable. If possible, keep the cut-out section in one piece so you can easily measure and cut the replacement piece. Select plywood or oriented strand board that is the same thickness as the wood you are replacing. If you were able to keep the removed section in one piece, measure it. If not, climb the roof and measure the opening so you can cut the replacement piece to be a perfect fit. Orient a piece of the replacement material so that its grain runs perpendicular to the roof trusses, and cut it to the dimension of the opening. Place the cut piece into the opening and secure it to the trusses with nails placed every 4 to 6 inches. Once you repair the hole in the roof plywood, you need to seal up the seams and recover the roof. Cover the seams between the old and new decking with bitumen tape. Lay felt paper onto the roof, overlapping the existing paper to get good coverage. Staple it to the roof decking or nail it with plastic-capped roofing nails. Now you're ready to replace the shingles that you removed. Slide new shingles under the top undisturbed course. Lift the shingle above it and nail it first through its own center, then through the center of the shingle above. Continue laying shingles in the established pattern until the entire repair is covered. When you fix rotted wood on your roof, you help to keep it watertight to prevent leaks and additional damage. Whether you replace the entire roof or just a section, the work you do gives you more life out of your roof.